The 59-year-old jurist with a master's degree in politics has been vice president since January 2016, when the Communist Party Congress reshuffled the country's leadership with the presidency going to Trần Đại Quang, a top conservative leader in the Politburo. The mystery surrounding his death is fuelling the rumour mill. 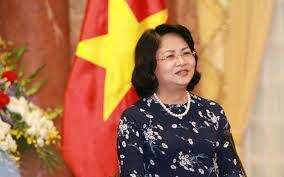 Hanoi (AsiaNews) - For the first time in history, a woman is president of the Socialist Republic of Vietnam. Appointed after the death of his predecessor Trần Đại Quang, Đặng Thị Ngọc Thịnh (pictured) will be the acting head of state until the National Assembly elects a new leader. Ms Thịnh, a 59-year-old jurist with a master's degree in politics, was first elected vice president in January 2016, when the Communist Party held a congress to renew the country's leadership. That same month, Trần Đại Quang, a key member of the powerful Political Bureau of the Communist Party of Vietnam since 1977, became president. Between 2011 and 2016, he had served as Minister of Public Security. Their appointment signalled the rise of members of the security apparatus inside the Central Committee and the Politburo of the Communist Party, said at the time Prof Carlyle Thayer, a well-known Australian expert on Vietnamese affairs. In Quang’s case, it was the first time that a police general became president of Vietnam, a sign that conservatives had the upper hand in a divided party. According to Thayer, Trần Đại Quang’s appointment has led to greater efforts to fight corruption and pro-democracy activists. During his term in office, he was harshly criticised internationally for cracking down on dissidents, bloggers and journalists. Nonetheless, Quang had worked successfully at improving relations with the United States, especially in relation to Chinese claims in the South China Sea. Daniel Kritenbrink, US ambassador to Vietnam, described the late president as "a friend" of the United States in his message of condolences. The diplomat noted how Donald Trump's visit to Hanoi in November 2017 contributed to "mutual understanding, shared interests, and a common desire to promote peace, co-operation, prosperity and security in the Indo-pacific region.” President Quang had been seriously ill for months, but continued to perform his official duties even though he was visibly tired and had lost weight. Following his death, Vietnamese authorities did not reveal the exact nature of his illness, except to mention "a rare virus". The lack of information about the president’s death after only 28 months into a five-year term has fed the rumour mill. A journalist, who prefers to remain anonymous, said “I was really surprised. Whilst many of the regime’s leaders are healthy or cared for, others like Trần Đại Quang, Nguyễn Bá Thanh or Phạm Quý Ngọ suddenly die of ‘strange illnesses’. They are all victims ... ".